While the glitter boots that opened Saint Laurent's autumn/winter runway show were one of the buzzed-about accessories from fashion month, we have our eye on another trend that's set to be huge in the coming months: the crystal choker. Just when you thought the choker trend was all but dead and buried (well, Alexa Chung's been feeling strong about it for some time) the jewel update provides a sophisticated take on the continuing trend, and might even replace your ribbon chokers from now on. What stands out most is the way the crystal chokers were styled on the runway. Instead of just one statement necklace, why not make it two? 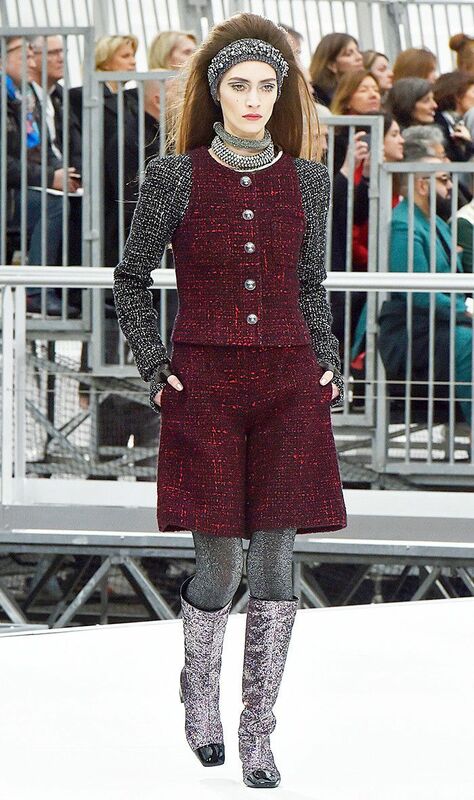 At Chanel, the glittery chokers were stacked on top of each other over a tweed jacket. And at Saint Laurent, the shiny necklaces were twisted together over a cable-knit sweater and patent miniskirt. Follow a few of these styling tricks, and the grown-up statement accessory can take you everywhere from the office to a dinner party. Get a jump start on the trend by shopping some of our favourite crystal chokers from Erickson Beamon, Isabel Marant, Dannijo and more. At Chanel, models wore two crystal chokers stacked together. Saint Laurent showed silver and black crystal chokers twisted together. Just a flash of crystal will offset any outfit. We love the idea of layering these two together. This is going to be a real future heirloom. Wear with a bold dress or simple tee and blazer. A more glamorous way to work this season's trend. Wear with a checked jacket and flared jeans. Just a flash of crystal for those easing themselves into the trend. We love this thicker style. Wear over a roll-neck for daytime glamour. Curious about this seasons other top trends? Next up, the best fashion blogs you should be bookmarking, right now.